If someone were to ask you what you think God looks like, what would you say? Think about that for a minute. I used to would say he looks like us because we were made in His image. But recently someone asked me and I realized that my ideal of what God looks like has changed over the years. As I grew older I started reading about who God is in the Bible. I learned about His wrath first, and then His love and compassion on us. I began to see Him more as an elderly Grandfather with a smile on His face, and open arms. I still saw Him as tall and strong looking, just not the wrathful killer with a spear. But once I grew up in Christ, I started to really study God’s word and I discovered that God doesn’t look like any of these images I’d attributed to Him. The Bible clearly says that God is Spirit (John 4:24) and that no one has ever seen Him (1 John 4:12). Yet, it also says that we were made in His image (Genesis 1:27). So how do we make sense out of the fact that God is Spirit, yet we “look” like Him? The answer is in how we were created, both times. In Genesis 1:27 we read that “God created man in His own image”, both male and female. Friends, there is a lot of difference in how a man and a woman look…and I’ll just leave at that. J Yet, His word says we were both made in His image. The key is in the word ‘created’, which in Hebrew is translated as bara (H1254). Bara means to shape or fashion out of nothing. In the same way the He created the universe by speaking it into existence, He “created” man in His own image. In Jeremiah 1:5 God is quoted as telling Jeremiah “Before I formed you in the womb I knew you”. Think about that. BEFORE he was formed in the womb, God knew him. But how? Until the womb there is no flesh. Was God speaking of His divine knowledge of the future as history? If so, God would have better said “I knew about you.” But that’s not what He said. Look back at Genesis 1:27. How many did he create in His image at that time? It says “male and female He created THEM”, which is plural. He was telling Jeremiah that He created his spirit man, the part of him that is in the image of God before he was knit together in his mother’s womb. Now I hear you! You’re saying “But wait Faithie! 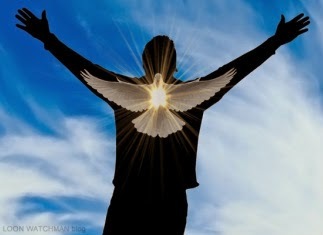 How did he get flesh on the spirit then?” Many of us understand that we are a two part being – spirit and flesh, but we haven’t read about when God connected spirit and flesh, or even that they were both separate created separately! And I’m going to be completely open and honest with you that this was recently news to me as well! But read after Genesis 1:27 until man is formed from dust in Genesis 2:7. What happens? 1. God blessed man and woman. 2. God told them to be fruitful and multiply. 3. God told them to fill the earth, subdue it, and have dominion over all animals of the sea, land and air. 4. God told them that He had given them every herb that yields seed on the earth, every tree with fruit, and all the animals as well for food. 6. The heavens and earth and all the hosts of “them” (Genesis 2:1) were finished. 7. God rested from His work on the seventh day, blessed it, and sanctified it (set it aside as special). 6 but a mist went up from the earth and watered the whole face of the ground. God had not caused it to rain upon the earth before the plants and herbs we were given as food had grown. They were not there! But return to Chapter 1 and you read that God had given these to man as food (Genesis 1:29). Whoa, a real time warp in the Bible? No. Not at all. Genesis 2 begins with a reflection of God on His creation and the end of creation as the seventh day. But then we read that “God formed man of the dust of the ground”. The word ‘formed’ isn’t bara, meaning created from nothing, but yatsar (H3335), which is to create from a preexisting substance, which in this case was dust. Moreover, He created (bara) them in His image in male and female form, but also formed (yatsar) man – not woman – out of the dust of the ground. Now ladies, you’re probably thinking that this refers to God yatsar forming woman. But no! That’s not what the word ‘made’ means here. When this verse says that “He made into a woman” the word made is rooted in the Hebrew word ‘banah’ (H1129). Banah is different from yatsar in that it is not to form something new from preexisting substance but to rebuild something that already existed. In the case of woman, we were the rebuild of man. As God put it in Genesis 2:18, His goal was to make man “a helper comparable to him”. Comparable is not identical. That is how man flesh and woman flesh were formed through yatsar and banah. But what about the spirit man that was bara created in Genesis 1:27? Breathed is naphach (H5301), which is too breathe, blow, sniff at, seethe, or give up or lose life. Man is adam (H120), which is man, mankind, human, and also refers to Adam, the first man. Life, and living, are both translated from chay (H2416), which is living and alive. Soul is nephesh (H5314) which is self, the seat of appetites and emotions and passions, the inner being of man. The soul was most necessary for man to have life. Because the soul contains the spirit of man, which is the life that God created in Genesis 1:27. It is also the home that He causes the Holy Spirit to live in when we are saved. Paul speaks in 2 Corinthians 1:22 and says that God “has sealed us and given us the Spirit in our hearts as a guarantee”. That’s a capital “S” spirit, which makes it a noun, the Holy Spirit, the very Spirit of God. Man wasn’t created just to till the earth and subdue it. We were made to be God’s special creatures, the only ones made in His image, which is to have both soul and flesh. The soul is the vessel in which He shows His great love for us in that it is there that He chooses to make His home with those that love Him.